Your life is serious business, but who says you can't find joy along the way? As a person with unique gifts to offer, it is your responsibility to use your talents wisely and it is your right to enjoy yourself while doing so. Just as a successful business requires a mission and a plan, so does a fulfilling life. 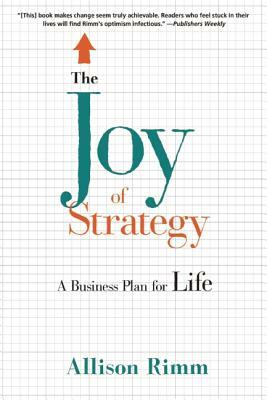 In The Joy of Strategy, Allison Rimm provides a structured, step-by-step program to create a business plan for your life. Through conventional business techniques and unconventional wisdom, The Joy of Strategy is the go-to guide for achieving satisfaction both in and out of work. Delivered with compassion and humor, The Joy of Strategy presents eight practical steps, useful tools such as the Joy Meter, and real success stories to help build and motivate your personal plan. With the perfect mix of soul and strategy, The Joy of Strategy will get you organized and on your way to a fulfilling life. Allison Rimm is a consultant, coach, and award-winning educator who inspires individuals and organizational leaders to create breathtaking visions and plans to make them come to life. She has merged her passion for teaching and mentoring with her strong executive skills to create her professional development programs and the popular Business of Life(TM) workshops. Allison is the former Senior Vice President of Strategic Planning and Information Management at Massachusetts General Hospital, a multi-billion dollar organization renowned for excellence and innovation. Now at the helm of Allison Rimm & Associates she helps clients benefit from the leadership, governance, and complex project management expertise she has developed in over 20 years as a senior executive and management consultant across a variety of industries.